There are two ways to eat more more pie. Cut a bigger piece or making the pie bigger. The first approach is the individualistic perspective as in essence you are eating away pieces from other while is the collective/stakeholder approach where everyone eats more. How much our decisions are affected by what we perceive the other side is gaining? Suppose in a negotiation between a buyer and a seller, the actual monetary value of the item of negotiation is 100$. The seller asks for $120 and the buyer offers $80. Presuming the need for the seller to sell equals the need for the buyer to buy, would the margin of leeway for one feel the same for the other? In other words, does it feel the same when you gain by selling at higher than expected price, or when you buy at lower than expected price. I guess it depends on the personality, but most other things being equal I would expect that the feeling of gaining by selling is not as strong as the feeling of gaining by buying. From the buyers perspective giving is cost and as such represents loss of profit. This is compensated by gaining credit in the form of the purchased item. For the seller on the other hand getting money represents profit and selling the item represents loss of credit. In that sense the seller’s reward is in the present (instant we might say) while the buyer’s reward is in the future, when he would sell the item he bought and make profit. So we see selling as an instant reward and buying as a future one. This is the leverage one has over the other, and should dictate the way they should approach the negotiation. If I could add some anecdotal evidence here, in all the simulations I had in my negotiations classes the buyers would outperform the sellers. Buyers are always on the initiating side while sellers are on the receiving end. A “stubborn” buyer will always outperform a seller in need to sell. There is also the influence on ethics that usually favors the buyer who is usually seen as the needy, and thus the one who deserves more sympathy (at least when the perceived needs are nearly equal). Obviously those who desperately need to sell are more of a victim than the buyers that see the deal as investment. The skill set required for buyer and seller roles is different. Strategy-wise, the question we are facing becomes: do you make the offer look good or the other person feel happy? You might think they are both the same but the reality is that one focuses on the deal/issue while the other focuses on the person. It is like decorating the object to make it look nice versus decorating the price tag. If you know the person or can guess their personality the answer would be obvious – adapt the offer by increasing its apparent value to the other side and work on the person. Humor is based on surprise- you expect one thing and another is said. It could be an exaggerated version of what you were expecting, or a shift to a different domain/context. This change in focus can be used to diffuse tension, mitigate a possible offense, introduce a difficult issue, and thus aid in the pursuit one’s own goals. What ever the purpose of using it is, everyone knows that humor is a purely manipulative act, as you want the other side to like you enough to accept your offer. This is easier said than done, and presuming you understand your counterpart’s culture, its function and usage is a matter of the relative power between the participants. Humor can be used in a repressive way when you are in power or in a contested way when you are the subordinate. Paying attention to its usage can tell you a lot about those involved. For example, what does it tell you about the person who starts the joke? Are they in power? Are they in control? What about who laughs at the joke? Did they enjoy it (presuming they got it, of course), or are they just trying to be compliant and pleasing? How far can you go? Either way you decide to use it, the purpose is to pass a message undercover using humor as a front. Problems arise when the other side can see through the cover, or if they see something else from what you indented for them to see. The latter is the case with cross-cultural negotiations. While you help break the ice in many cases using humor in cross-cultural setting, one man’s humor could be another man’s insult. Despite the good intention behind adopting such strategy, the challenges one is facing are tantalizing. Also, the choice of the type of humor can be tricky; do you use ironic exaggerations or jokes expressing an incongruity? Another important concern is the subject. Do you make it about the weather, or do you do make about the negotiation? Whichever you decide to use, do not aim the joke towards people, even if you are making a joke about yourself or your own culture. Putting your side down might be seen as manipulative and create the opposite effects of what you were expecting. Humor is a risky business- play with it carefully. Can multiple simultaneous offers be beneficial? Presumably, one goes to negotiations knowing their limits (BATNA, NOPA or simply how low and/or how high you can go). Presuming also that there are many variables at play, converting these limits to multiple alternative offers shouldn't be difficult. Why, though, would one do such a thing as submitting multiple offers? According to a post at Harvard Law School (source) "when you present multiple equivalent simultaneous offers, or MESOs, you show other parties the issues you value most. In turn, their reactions to your offers tell you about their priorities." This according to the researchers mentioned in the post is advantageous in financial negotiations. These are his relative BATNAs, so you now know how far he can go while still making a profit. One could probably quantify in some way any parameter (in our case we could put weights for taste preferences), so maybe you shouldn't give away details by submitting multiple offers. Although the research in the source is about political misconception, it is easy to see its existence in many negotiations (especially when such negotiations concern every day conflicts and issues). In the research, subjects read mock news articles that included either a misleading claim from a political viewpoint, or misleading claim and a correction. Surprisingly, to some, the corrections frequently failed to reduce misconceptions. In fact, in some several instances, it triggered a “backfire effect”, in which corrections actually increase misrepresentations. Of course, research was not required to find out what anyone with 10 years of marriage could have told them. Never prove your spouse is wrong, or you will pay for it later in multiple ways, some of them quite unpleasant (so I hear)! In our case of negotiations, imagine trying to negotiate with someone that has strong beliefs about an issue and are presenting him facts to the oppose these. This is a case where “motivated reasoning” (as termed in psychology) can strongly influence negotiations. There are usually two ways people employ when in favor of preserving false beliefs: performing biased searches and selectively seeking information that enforces such beliefs, and/or by avoiding evidence undercutting them. Can a fact be communicated in a way neutral enough to be easier for the other side to accept? Would they be more likely to reconsider their position? Or would they feel threatened and become rigid? How do you deal with someone that feels threatened at the challenging of their beliefs? This is a difficult situation, and unless one is in a position of power, the only ways I know would be to "lead" the other party to discover the fact, or let them discover your awareness of but refusal to reveal this fact, and thus continue negotiations as though it does not exist. When the other party sees who is in the position of power (you), and also sees how you refrain from calling on it, they perceive that you value their feelings and acknowledge their situation- and that will not only give you the negotiation, but also a long lasting positive image. If, on the other hand, you count on small, short-lived gains, then you might as well go with unleashing the facts and bulldozing your way in- but there will be no one left to celebrate your success but yourself. E-negotiations is a much different case, although one would expect to see the effect of motivated reasoning there as well. The absence of face-to-face interaction, while removing emotional heat, still can not remove the cognitive bias imprinted in strong beliefs. The result of three studies (see source) seem to indicate that people find it easier to be deceptive online than when using pen and paper. Additionally, people even feel more justified when they do so. This apparently is because of the ambiguity of the online medium as carrier of appropriate behaviour. It is well known that people feel more removed from both their own behaviors and the effects of their actions over e-mail than on print. Lying usually requires justification and apparently the remoteness of the online medium increases the psychological distance between the actor and the “victim” of the deception, which changes the actor’s perceptions of their conduct and the harmful consequences of their actions. Email is generally viewed as less permanent, more impersonal and detached than print communication so its natural to expect that typing on a computer (say, for a blog like this one), is more liberating from strict moral guidelines than in face-to-face communication, such as talking to someone over the phone, but it is interesting how the research brings out the same attitudes in online versus print communication. I guess the old belief that writing (like say a contract) is more permanent and valid than speech (say a promise or giving our word) is still holding strong and, in a way, is transferred online. It wasn’t like this, though, at the beginning of the Internet, when academia and businesses were its main public users. The flood of people that nowadays reach out using the Internet for social purposes has changed the impression of the formality of the medium. The general belief (false, of course) that the easier something becomes the less restrictiveness and weight it seems to carry. Consider the “innocent” act of downloading an image from the web. If it was “really” illegal wouldn’t it be more difficult to do so. Here though we have two forms of communication (paper and online) that both use text, they have strong permanency (in fact online something will longer than on paper), can be forged (actually paper easier that online in most cases) but one (paper) seems to be more “serious” than the other (email). How can we use this to our advantage in negotiations? Have you tried to communicate critical issues by using a pdf instead of typing it as text in an email? I mention here pdf and not include Word documents as the later are officially only considered as drafts online and not as documents (presumably because it takes more effort to change the content of the former). Here are some things that I found useful (serving as administrator) and relate to the research findings in an indirect way: • Send your CV as pdf and never as Word. • If you want to pick more negative (realistic) feedback ask for it as email instead of face-to-face or in paper. It seems that longer words carry more meaning at least for Czech, Dutch, English, French, German, Italian, Polish, Portuguese, Romanian, Spanish, and Swedish that the MIT research used (link). It makes sense to use small words to carry information that we exchange frequently as we conserve energy on the average per sentence but why do we put more meaning in longer words? The research does mention exceptions to the rule and also admits that the proof might not be as strong as they wished but I have to say that at least intuitively it makes sense. One can also see it in the way we create abbreviations like OMG and LOL to save effort and time. The question for e-negotiations is do we use sophisticate language when communicating online or simple words? What does this say about a person? Which sentence carries more meaning? If we also eliminate “I submit this for your” as redundant because: “I” its obvious its me since I submit it; “submit” is evident by the act – the other person sees me giving it or it shows as an attachment; “this” its obvious since this is the only thing that exists (say as attachment); “for your” its obvious that its for you since you got it. Then we can see that the actual meaning in the sentence can be carried out by the last word. Does the longer word carry more meaning? Although the word attention might simply mean that I am aware of the existence of something in the context of the example here it means attention to the content so it does imply one needs to review it. For something to become information it definitely means that it drew my attention and I am aware of its content. Consideration means that some action is expected of me so I have to know the information in it. Another issue that plays a critical role is urgency. If you fell down and hurting you don’t start describing the event in elaborate English “Oh my god, I had the misfortune to lean my weight on a banana peal that due to low friction ….eventually thrusting my lower rib into the staircase…..can you please assist me …”. This is an interesting twist of the anchoring effect that early offers create in cross-cultural contexts. In a previous post we commented on research that suggested that late first offers allow for more creative solutions. This research (see source) though shows how it can affect cross-cultural negotiations. Apparently Japanese negotiators consider first offers as part of information gathering while for US negotiators it represented information consolidation. In simple terms a typical (or better yet a stereotypical) Japanese negotiator is less fixated/anchored in early offers than his counterpart US negotiator. This proves the point that understanding the opponent’s culture is not only important – it’s critical. Without such knowledge the Japanese (high-context culture) will probably think the American is stubborn and not considerate enough while the American (low-context culture) will probably think the Japanese is not serious about the negotiation or they don’t know what they are doing. Confusion will inhibit creativity on both sides. In the context of the “spiral” framework we introduced in the book the two negotiators are out-of-sync with the Japanese in the Intelligence phase and the American in the Strategy phase. How can we bring them in-synch? Collectivist cultures like East Asian value harmonious team relationships more than Western cultures where in-group competitiveness is acceptable and can lead to better outcomes. The cited source supports this fact based on negotiation exercises between US and Taiwanese teams. When the Americans worked in teams they produced superior results primarily because they would explore and consider more diverse and radical alternatives as they were brought up and defended by each member. The Taiwanese on the other hand would be cautious about group harmony and apparently wouldn’t challenge each others positions resulting to adopting suboptimal strategies. That is probably a good lesson to remember and avoid taking friends to help us in negotiations. This was probably expected but it is nice to see it confirmed even if that is through the Prisoner's Dilemma game (See source below). In this case it was between two negotiators one of which employed an extortionist strategy while the other one was generous. In the short run as Round 1 of the image shows extortionists win most of the times. The situation though changes radically when huge numbers of negotiators and learning is involved as shown in the follow-up rounds. Extortionist tend to be punished when facing other extortionists leading to eventually being converted to generous. You can follow three rounds of the game in the image to see how it evolves. The implications for the evolution of human society with humans as cooperating agents is evident. An interesting thing would be to see if we would have more effective negotiations in critical issues if multiple teams were involved. Maybe the average would be far superior to the individual negotiations. Imagine having more than one teams in Israeli - Palestinian negotiations concurrently and independently negotiating on the same issue. Would they come up to same resolution? Even if we followed the average things might be gotten better. A Zerox PARC research seems to suggest that personality characteristics can be inferred from the content of the emails we exchange. Although this sounds more or less what we all do when we read an email it is interesting to see how they attempted to address this issue scientifically. To make it more exciting the researchers used a single email to make predictions. The fascinating thing about such research is that it can be quite revealing about some of our own personality traits that surface in our email exchanges. 1. Collecting and counting the frequency of commonly used words in everyday life from each email (since they presumably and according to research better identify sentiments - unique words instead tend to identify individuals and not personalities). 2. Calculating TO/CC/BCC counts, importance of the email, count of different punctuation symbols, count of words, count of characters, count of positive and negative numbers, count of paragraphs, count of attachments, month of the sent time, day of the month of the sent time, and day of the week of the sent time. Also differentiated between replies and forwards and included the time it took to respond. 3. Processing of text and sequentially tagging each token with syntactic labels, such as noun and verb, based on its definition as well as its context - i.e. its relationship with adjacent and related words in a phrase, sentence, and paragraph. 4. Adopting sentiment analysis (identifying positive and negative opinions, emotions, and evaluations) to generate features from the email content. Past research has shown that the usage of pronouns and negations can be indicators of emotional states. For example, the word “me” and “not” are related to anger and the word “I” is related to emotional vulnerability. In this category also belong the all upper-case letters and words case. 5. Studying greeting, closing and wish patterns as well as smileys. 6. Detecting email tone and purpose (verb-noun pairs usually give that out). The question is how accurate can we get and how reliably can we automated this process? I am purposefully leaving out ethical and privacy issues for a later time as my imagination can see a lot of violation cases. The report (available here) tries to identify critical trends and potential discontinuities in the near future. 1. Would the US power decline and how other powers would respond to such decline? 2. Are the rates of change for some underestimated (like is China growing faster or slower than expected)? 3. Are there relationships between trends, discontinuities and crisis that can be used to predict events? 4. Can war-games or simulation exercises explain the dynamics among international actors at crucial tipping points? Some of the megatrends identified in the report (like individual empowerment, diffusion of power, the demographic arc of instability, food, water, and energy nexus) are bound to influence negotiation processes and practices but to what extend and how? It is well known that first offers have a tendency to anchor negotiators so it is probably no surprise that delaying them allows the parties involved more time to inform each other and explore various possibilities. Now (see link) we also have some research in support of this. The paper starts by providing as an example the failure of the 2000 Camp David meeting between the Israelis and the Palestinians where the two parties made their initial offers early on before giving a change to each-other to express their needs and fears. This apparently anchored them in those initial offers preventing in this way the exploitation of creative alternatives and leading to the collapse of the negotiations. These findings might seem to contradict previous research (source) that found that making the first offer provides a critical advantage but in reality it complements that result as it adds timing as a parameter that affects outcome. Of course I would argue that it is also the style and quality of the discussion that takes place before the first offers that should be influential but maybe I am wrong? What is the best technique for influencing someone? According to this expert "the idea is to really listen to what the other side is saying and feed it back to them". Knowing how our counterpart perceived our proposal can be quite revealing and a great asset in negotiations. Apparently (not much of revelation here) we all have different brains and process things in distinct ways so it would be amazing if we could have a perfect understanding of what we project. We could theoretically change that projection in real time to manipulate the other person's impressions. Any ideas on influencing techniques? Could focusing on differences cause perspectives to converge? Considering other person’s perspectives is vital in most negotiations. The outcome of such exercises is usually a list of similarities and differences about perspectives and issues. Traditionally in negotiations we tend to start from the similarities/common ground and move towards minimizing the differences to close the deal. The only danger with this stand appears to be over-identifying one’s own perspective with the perspective of the other side loosing in this way a genuine interest to support our side. In addition the merging of the two perspectives if nothing else it confuses our original point of view. A series of experiments seem to indicate that focusing on the differences might work in better understanding the other side’s perspective without loosing our focus on our interests. The moral: Don’t stay too long in your opponents mind. Maybe we should also consider context as parameter as we mentioned in a previous post. According to recent research emotional inconsistency and unpredictability can increase concession making in the recipient primarily because it makes them feel less in control. Of course I would argue that this is culture specific as in many cultures it would most definitely trigger defensive attitudes that could escalate a situation out of control. Classic examples of impulsive displays include Queen Elizabeth with her performances of emotional inconsistency that helped her secure greater concessions from opponents, and Nikita Khrushchev and Charles de Gaulle that believed negotiators should act mysteriously to throw an opponent off and gain the upper hand. One shouldn’t also forget the master negotiator Henry Kissinger who promoted his president Richard Nixon in 1969 as “madman” to force the Soviets to arms control deals. Careful attention though should be given to the authenticity of the emotion as bad actors can easily be spotted undermining the whole play. Can we communicate as well as we think? Five experiments (follow link) suggest that most of us tend to believe they are better with email than they actually are especially when the meaning of the message is ambiguous. Apparently egocentrism as a form of social judgment is in action. It seems that we are actually “hearing” the message in our brain and in the absence of a real audience we presume that what looks fine to us will look the same to others. What do you do in such cases? It’s like a stand-up comedian who hears the audience laughing in his head while practicing a joke only to find out later that the audience didn’t find it that funny. When should we be the first to make an offer? This is a typical “anchoring” case. First offers have a tendency (see research link) to dominate negotiations and influence perceptions. Making a low first offer could position one much lower from what the other side was willing to offer while an extravagant high first offer could project an irrational image and end the negotiation right away. First impressions like anything else in life tend to be quite influential so being in control and making a high end first offer can be effective as long as it’s not extreme. If nothing, it projects confidence and understanding of the true value of a deal even if that its an overestimate. In addition to also drawing attention to the gains/positives of the deal it makes the other side believe that you know what you are talking about. The trick though is that you should only do it when indeed you know what the status of the market of such deals is. Bluffing can be quite painful especially if the other side is knowledgeable about the market. How can you compete and cooperate at the same time? A simple answer to the question is: cooperate in building a bigger pie and compete in getting the bigger piece. The research (follow link) demonstrates that in dyadic negotiations, negotiators with a promotion regulatory focus achieve superior outcomes than negotiators with prevention regulatory focus by creating more resources at the bargaining table and claiming more. Maybe this can be useful in salary negotiations. Depending on the order of magnitude values that are multiples of powers of 10 are more often quoted as first offers than precise numbers. What if instead of asking for a salary of $75000 you ask $74800? Of course we are not talking of offers like 14893 that will apparently make you look weird but apparently there is a kind of margin (something like 5% up or down) from the round figure that makes one look more knowledgeable/thoughtful than usual. The research in the link suggests that negotiators who use precise first offers more effectively anchor their counterparts simply because it makes them look more informed of the good's or service's value. The email exchange between Steve Jobs of Apple and James Murdoch of News Corp that has been released by the US government is a great case study of high-profile executives engaged in e-negotiations. This case proves such negotiations to be the norm in in many instances. There is a usual perception of Steve Jobs picking up the phone and bossing his way around but its interesting to see how the same can be done with email and without much of the emotions involved in face-to-face negotiations. If you want the original release by the US government you can find it here. A nice brie is also here. While the source below is a commercial it could well be an experimental study. Reminds me of student assignments were they were required to observe such negotiations. Unfortunately when I teach e-negotiations I can only provide email trails (not as entertaining as this one). Brief post of the spiral negotiations framework under the title 'E-Negotiations: Making Due Without Visual Queues". We start with the intelligence phase where we try to find as much information as possible about the issue at hand and the parties involved. We then try to make sense of what we found and based on that we build our negotiations strategy. Finally we execute the strategy by communicating our intentions and our proposals. To avoid the stress of taking their exam, the students decided to capitalize on a loophole in Froehlich’s (professor of the computer programming class) grading system. Well, the unexpected happened and all students decided not to show up for the exam. In fact some guarded the halls so no one leaked to enter the classroom. a. I and the rest of the students show up so the grades are distributed along some normal curve. I get an "F" as I didn't study at all. b. I and the rest of the students boycott the exam. No one show up so we all get zero that as the highest grade in the class becomes an "A"
c. I break the boycott and even by just writing random answers get something above zero which automatically becomes "A" while all the rest get an "F". d. I boycott the exam while the rest take it. Obviously I get an "F"
Option c (Nash equilibrium) is considered the most unlikely as it requires maximum cooperation between the competing agents so statistically speaking everything else but this would've happened. Human nature though can be unpredictable at times so it forced the unnatural to happen as all students agreed to sit out the exam. We have a case like that with two supermarkets competing in the book but reality can obviously find ways to disobey theory. LA - Dubai: What time of the day is better for negotiations? 11 hours apart could seem too much but in many cases its better than 8 hours apart. By default for two people to communicate during the daylight so far apart one will be living a morning while the other an afternoon. They will be both looking the same sun (colors and size) but at different parts of the horizon. One has just arrived at work while the other already left. One under the pressure of time and performance at work while the other probably relaxing at home. One has focus while the other can afford the time. Both with their advantages and disadvantages. Both can be geared as advantages if one plays it right. Everything else kept invariable the real influence here, might be the cultural perspectives. Americans in working mode are far better in the morning than in the afternoon. Arabs on the other hand (especial those near deserts) are quite comfortable working in the afternoon as the sun in the desert can really limit ones function and thinking (especially during Ramadan). The only neutral territory is probably Saturday as the only day of the week when both are not working. Who negotiates with Apple in product development? 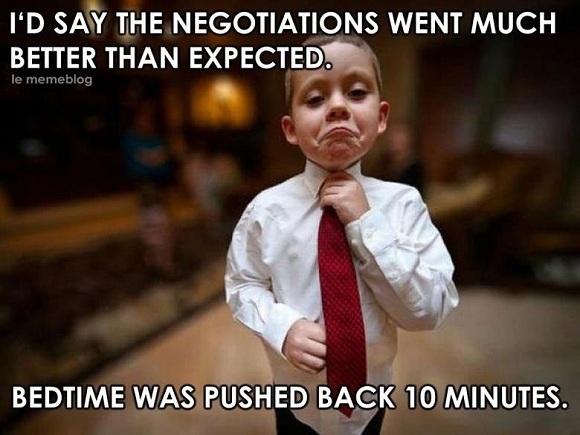 Predicting the outcome of negotiations from the first couple of seconds! 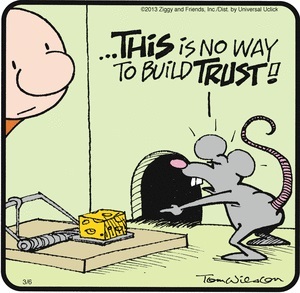 This is game theory and behavioral economics working together to predict the outcome of a negotiation. The amazing thing is the EG recordings of the two brains when negotiating. It would be interesting if we had the technology to measure what regions of their brain each person is activating. Scary?